I don’t watch football. In fact, I’ve watched one game and that was only because I was in a football stadium while two teams were competing. Admission was complimentary for the culinary arts students who had helped serve at a University of Hawaii alumni barbecue. What else was I going to do? Where else was I going to look? It was a lot of fun. I was grateful for the pass and a hoot of a time with some college friends and the goofy professor who kept pulling a flask out of his coat pocket, but I don’t really care if I ever sit through another one. Since I don’t enjoy it, my husband and sons gather in the living room every Super Bowl Sunday and send me to the bedroom where I usually watch Netflix movies. Before I disappear, I cook up a storm, fix a plate for myself, and dump everything on the coffee table for the fellas to devour. Today we followed our usual routine, but dessert this year was my husband’s idea. Before I did my game day shopping, I asked what he thought they would all like. His suggestion? 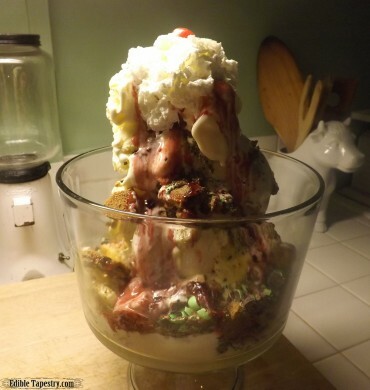 How about a SUPER BOWL sundae? Like a big ice cream sundae! He held his hands out to simulate holding a large, round dish of ice cream, and I immediately thought of our wedding day. That may sound funny to anyone who wasn’t there, but the day we married we did not have cake. We had an Extravaganza, the enormous ice cream sundae that was served at Ronnie’s deli in downtown Orlando. 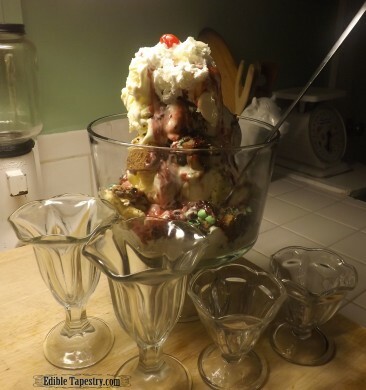 During the decades that the famous restaurant was still in business, parties of people would gather around and scoop their own portion from a huge sundae glass of gooey ingredients. 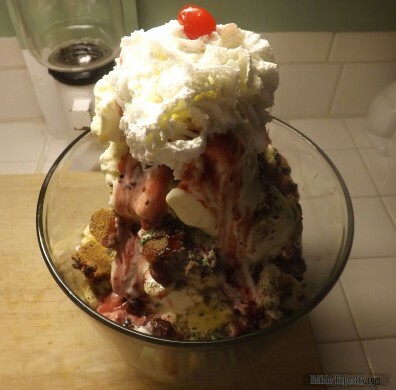 I realize now that a good part of that gigantic sundae was spumoni and cake. I also remember lots of nuts and fruit, and of course the mile-high mountain of whipped cream that teetered on the top below the maraschino cherries. What a great idea!!! I jumped on it and bought vanilla ice cream, bakery pound cake, candies, bananas, and that cool squirt-from-the-can whipped cream that I haven’t had for years and years. You know the kind you just have to spray into your mouth as soon as you pop the top? Just before the game ended, I began to assemble the layers. 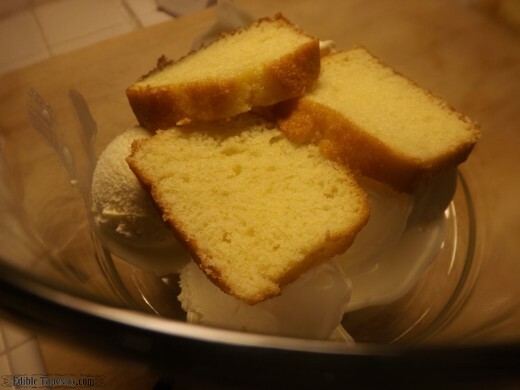 I started by scooping ice cream into the bottom of a trifle bowl, and added slices of the cake. Then I crushed Little Debbie Nutty Bars, pretzel and mint M&Ms, and chocolate chip cookies. I sprinkled them between more layers of ice cream along with slices of bananas. I remembered that I had a few containers of strawberry freezer jam, so melted a little to drizzle over the top. Then it was time to got to town with the spray whipped cream. My intention was to deliver it to the “Super Bowl table” and run, but the finished product called to me… I’m SO glad I answered by breaking my self-imposed no-sugar rule and having a dish. 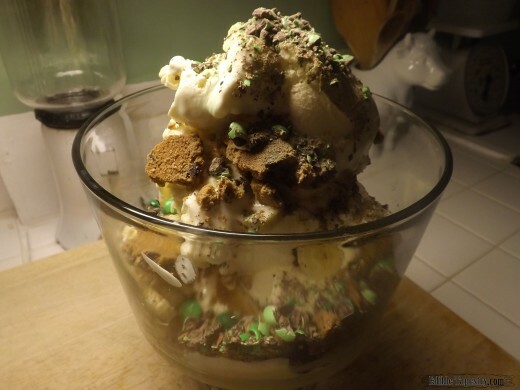 A real SUPER Bowl Sundae extravaganza!! And now I have a problem. I made it SO big that we hardly dented it. Will someone please tell me what to do with a big bowl of ice cream, cookies, cake, and candy that is quickly melting. Freezer or fridge?